The Commute | An informative and entertaining discussion on our ferries and highways with Kitsap Sun reporters. Any high school kids think they can draw a ferry scene? First it was 10-year-old Ellie Heldridge of Seattle who won the winter sailing schedule drawing contest for grade school kids. Then 13-year-old Alexander Sowers, also of Seattle, won the spring schedule contest for middle schoolers. Now the high school kids (grades 9-12) are on the clock for the summer schedule drawing. 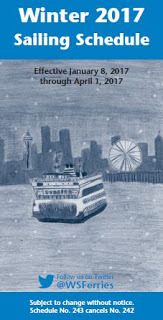 The theme is “Summer Sightings on the Ferry.” Artwork will be accepted until April 10. The winning drawing will be featured on the cover of more 985,000 summer schedules, distributed aboard 22 ferries, 10 terminals and throughout ferry communities. The winner and five finalists will also be featured on the WSF website, WSF Twitter and in the WSF Weekly Update newsletter. This will be the first contest to allow computer graphic design in addition to those produced by hand. Artwork will be accepted online via Survey Monkey or mail through April 10. A complete list of submission requirements can be found on the WSDOT blog. 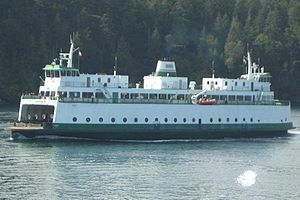 West Sound is the ferry capital of the world. Quit letting those Seattle kids win. I don’t envy those who’ll be trying to fix the triangle ferry route. The solution probably requires cutting sailings so boats have time to load and still keep the schedule. Riders from Vashon Island and Southworth don’t want less service. They want more, especially more direct runs, at the expense of each other. Meanwhile, the Fauntleroy community doesn’t want anything to do with either of them. It would prefer that the ferry dock just go away. I’d probably feel the same way too if I was in their shoes, though the dock has been there probably longer than most of them have. Ferry traffic creates a freeway through their neighborhood. They especially hate the motorcycles that get off the boats first, roaring down Fauntleroy Way early in the morning. Washington State Ferry officials held “listening” meetings in Southworth, Vashon and Fauntleroy two weeks ago, writing down all of the public comments. WSF director Lynne Griffith and members of her executive team heard from more than 120 people and captured more than 400 comments. They’re assembling a community task force to review the comments and other data to identify “quick wins” that could improve service by summer, and exploring longer-term solutions. Fauntleroy residents rarely use the route, but suffer its consequences. Many of their comments suggested that it operate out of Colman Dock in downtown Seattle instead of in West Seattle. There’s an extra slip at Colman, but the dock is being rebuilt to strengthen it against earthquakes over the next five years. Construction will cause a frequent loss of one of the three slips and a reduction in vehicle holding capacity. 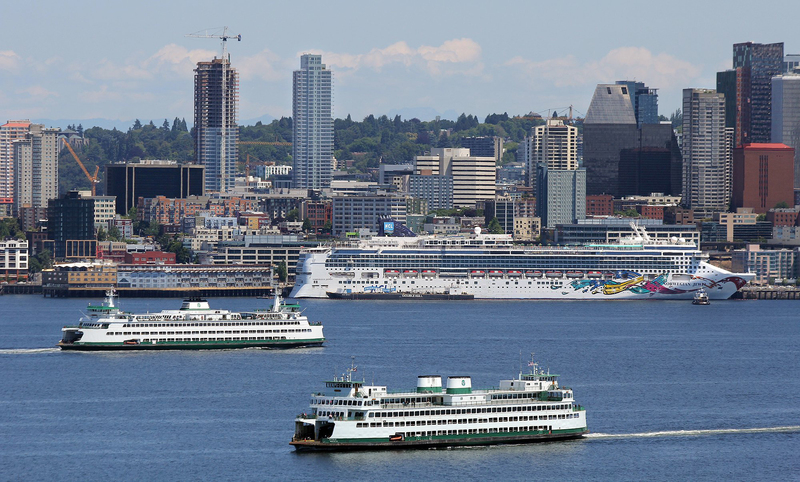 When WSF last proposed diverting Southworth ferries to downtown in 2006, the city of Seattle said it didn’t want any more cars brought into downtown, said WSF planning director Ray Deardorf. And, what about the riders who aren’t headed downtown, who work south of there. This isn’t the first time the downtown vs. West Seattle question has been batted around. An origin and destination study in 2013 showed 53 percent of Southworth travelers wound up south of the West Seattle Bridge and 47 percent went north. From Vashon, it was 59 and 41, respectively. Fauntleroy commenters didn’t have much good to say about the route. Ferry riders clog up streets, throw cigarette butts all over, their big trucks shake houses. The destination study actually showed 18.8 percent of Southworth riders and 12.2 percent of those from Vashon are bound for West Seattle, nearly as many as are going downtown. At the other extreme, Vashon and Southworth riders proposed that the state buy properties near the Fauntleroy dock, by eminent domain if necessary, so parking and staging areas can be enlarged. They call for more lanes and a second slip. One of the biggest issues is loading there. There’s not enough space to sort vehicles for two destinations, plus deal with pre-paid tickets and those who are buying at the booth. Vashon and Southworth want more sailings, particularly more direct ones to or from Fauntleroy that they don’t have to share. There’s not much room to squeeze more trips into the schedule. Whatever one community gains would be at the expense of the other, a source of division for decades. “Vashon gets 3 times service to Southworth and pay LESS,” wrote a Southworth rider. “Eliminate the SW run!! !” said a Vashon resident. “Vashon is an island, Southworth is not and ok with eliminating SW service,” said another. Based on historical use, Vashon has received 65 to 70 percent of car spaces and Southworth 30 to 35 percent, Deardorf said. In 2015, Vashon had 67.7 percent of the traffic and Southworth 32.3 percent. The most heated debate continues to be whether to fill up the boats at the expense of being late or having to cut sailings versus leaving on time. The ferries system is more concerned with on-time performance because that is among performance measures it’s required to send to the Legislature. I cherry-picked comments from the hundreds submitted to illustrate a point that this is no easy fix. There were many good suggestions, particularly about loading boats at Fauntleroy. That seems to be Job One, and one they can work together on because it should benefit everyone. 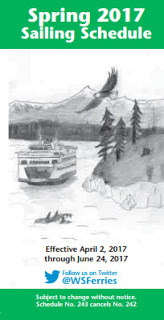 In recognition of the school year beginning, Washington State Ferries is holding its first-ever drawing contest. The topic is what winter on the water means to me. Students from kindergarten through fifth grade can participate. Drawings will be accepted via email or snail mail through Oct. 14. The winning drawing will be featured on the cover of 400,000 winter 2017 sailing schedules. Besides the winner, five finalists will be selected and featured on the WSF website, on Twitter and in the WSF Weekly Update newsletter. 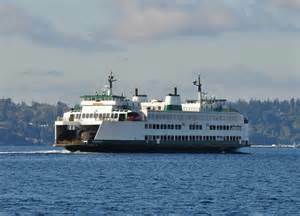 Submission requirements can be found at http://wsdotblog.blogspot.com/2016/09/washington-state-ferries-back-to-school.html. Summer is going out with a bang — and backup — on Washington State Ferries. The boats, which since June have been carrying about 80,000 people a day, are expected to have an extra 10,000 hop aboard over the Labor Day Weekend. Those who must travel at a certain time, in a car, can expect to wait one, two or even three hours. I’ve never seen a four-hour wait. Who would do that. But then I’d never seen three hours until this year. It’ll be much easier if you can walk on and/or travel when everybody else isn’t. There’s almost always room for foot traffic, unless you’re coming home from a Thursday night Seahawks game. The Department of Transportation also offers a few tools that can help. If your last hurrah is taking you to the San Juans or Whidbey Island, reservations are available. Only 10 percent of spaces are available for standby customers, so it’s about the only way to go on weekends, especially 3-dayers. Terminal cameras will show just how the docks and beyond are filling up. You can sign up for email alerts that tell when a boat’s running late and how long the wait is. That information also is provided on Twitter. The summer sailing schedule shows the best times to travel. Traffic is approaching levels not seen in a dozen years, when tickets cost half as much. The system carried more than 7.4 million people this summer from June to late August. The Seattle-Bainbridge route was the busiest, moving more than 1.9 million passengers, followed by Edmonds-Kingston at more than 1.2 million. Ferry ridership continues to grow, though not at the pace of a year ago. During the past quarter ending June 30, Washington State Ferries carried 1.4 percent more people than in the same period last year. Passengers were up 1.9 percent jump, drivers just 0.8 percent. Planner Ray Deardorf in January predicted, based on traffic forecasts, that the boats would tail off from their 2.9 percent jump in 2015. He expected growth of 0.5 to 1 percent per year. They lost riders because they cranked up ticket prices, some years by 20 percent, after losing a major revenue source — license tabs — in 2000. After fare increases stabilized at about 2.5 percent a year, ridership hit bottom in 2012 and has climbed the past three years. How far can it go? We’re 3 million away from the peak of 26.8 million in 1999. That should be reachable. The population has boomed since then. Eight new boats have replaced smaller ones, or will in the near future. There’s room on the ferries, though you wouldn’t know it at Kingston on a Sunday afternoon. Three-hour waits are not uncommon. People actually sit in their cars on the side of the highway for three hours. There’s a huge westward flush on Friday, a back flow east on Sunday. Boats are packed with workers an hour or two each weekday morning and evening, but most of the time there’s space. It’s just that most people have inflexible schedules that are pretty similar. It’d be nice if the crowds could be spread out, or have more sailings during peak times and fewer when it’s not busy. That would probably require peak-time pricing, or more boats, bigger docks and a lot more money. I don’t foresee those busy times changing. You avoid them when possible, otherwise that’s just part of riding the ferries. Before the whole funding mess started, ferry trips were the best deal going. Now the pendulum has swung too far the other way. In 1999, a round-trip passenger ticket cost $1.85. Car-and-driver fare was $6.50 each way. If accounting just for inflation, those prices would be $2.59 and $9.10 today. That doesn’t even seem possible. I wonder what ridership would be at those prices. Instead, after a decade of exaggerated fare hikes, they’re $8.20 and $14.60 (we won’t count the peak-season surcharge). Four bucks each way to walk on still seems reasonable. Taking a car is getting to expensive for many people. Ticket revenue paid for about 60 percent of operating costs back when prices were so low. Now it’s at about 73 percent. I’ve heard people say if tickets cost less, more people would ride and they’d make more money. It doesn’t work that way. Yes, fare hikes do cost them riders, but not enough so they don’t pay off. They would make no sense otherwise. There does come a point where prices are so high that they lose so many riders that they begin losing money, but it’s out there a ways. Back to the quarterly numbers, locally, Bremerton (-4.3 percent), Bainbridge Island (-1.9 percent) and Southworth (-1.5 percent) all lost vehicle traffic compared to last year. Only Kingston, at 0.7 percent, grew. Part of the reason could be the disaster of trying to drive near Seattle’s Colman Dock. WSF’s Deardorf also noted the numbers might indicate a decade-long decline of commuters might be bottoming out. Kitsap Transit continues to refine its SK Rides service to address riders’ requests. The service, which enables residents in the Old Clifton Road area to reserve trips with their phones or tablets, will begin offering rides to the Port Orchard passenger ferry on Monday. Residents suggested trips to the 6:30 a.m. boat to get them to work in Bremerton. The agency responded by bumping back SK Ride’s start time from 6:30 a.m. to 5:45 a.m. and offering direct rides to the dock until 8 a.m., said spokesman Sanjay Bhatt. Three months ago, the agency added direct trips to the Sedgwick 76 gas station, where riders can meet the Bremerton-Kitsap Airporter, followed a month later with a stop at the Sedgwick Fred Meyer store, where they can transfer to the No. 8 Bethel route, Bhatt said. The bus already connected to the No. 4 Tremont route at Harrison Medical Center or Old Clifton Road, and to the No. 5 Sidney route at Sedgwick Albertsons or Cedar Heights Junior High. It also serves Bremerton National Airport and Olympic View Industrial Center. Trips must begin and end in the service area, which centers around McCormick Woods, Sunnyslope, The Ridge and McCormick Meadows. Ridership has grown from 20 in November, when it was introduced, to 147 as destinations expanded and people became aware of it. When the bus isn’t booked, it pulls double duty running Access service. It’s Kitsap Transit’s first route to offer Uber-like digital reservations. Riders download the TapRide application, select “Kitsap” and register their phone number. Then they’re able to click on a map where they want to be picked up and dropped of. The driver, who’s following along on a monitor in the bus, responds with an estimated pickup time. The cost is $2 full fare and $1 for seniors, youths and disabled people. It’s easy to use, said Roger Gay, who attends transit board meetings and often asks for updates on SK Ride. He was picked up at the airport and delivered to the Sedgwick Albertson, where he hopped a routed bus to the foot ferry. He believes it should be much more popular. “It works. It’s a nice system,” he said. “It’s just that not that many people are aware that it is available and that easy. Transit officials devised similar hybrid services on Bainbridge Island and in Pouslbo. With a vote coming up in four months, Kitsap Transit is distilling its cross-Sound ferry proposal into digestible morsels. It added a colorful, easy-to-understand fact sheet, PowerPoint presentation and posters to its project page. The full plan is there, too, for the ambitious. I’ve written so much about the proposal, I’ll spare you a repeat. But I discovered some interesting nuggets among the new material. 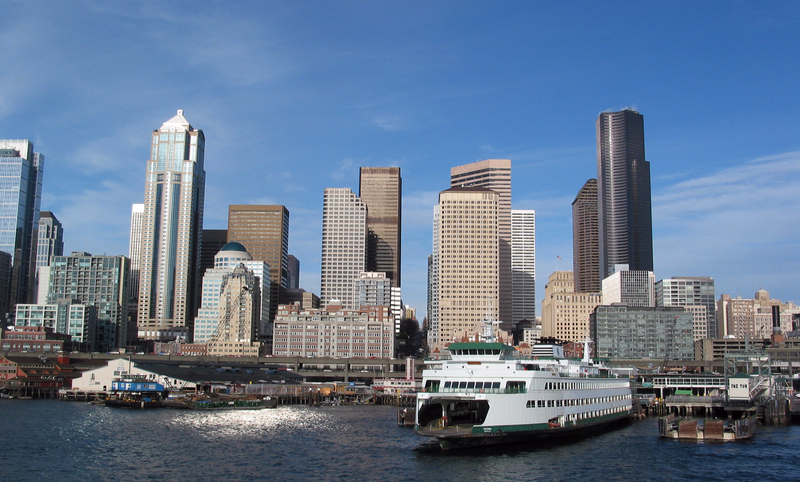 Did you know, for example, that more Kitsap residents work in Seattle than in Bremerton? In 2014, according to the U.S. Census Bureau and Bureau of Labor Statistics, 14,088 (16.6 percent) were employed in the Emerald City and 10,576 (12.5 percent) in the Navy town. Ten years ago it was flipped, with 16.6 percent working in Bremerton and 13.9 percent in Seattle. The numbers don’t include armed service members, but do account for Puget Sound Naval Shipyard workers. The facility’s ranks spiked from 10,898 in 2014 to 13,266 today, which could push Bremerton back past Seattle in total workers. The point remains that tons of people — 51 percent — travel outside of the county for work. And the percentage is likely to grow. According to the Puget Sound Regional Council, Kitsap will gain more than 50,000 residents by 2025, but only 20,000 jobs. Transit, of course, wants people to consider whether they might need another commute option. Low-income people get to ride Kitsap Transit’s buses for half price, and the same would apply to cross-Sound ferries. State ferries don’t offer that discount. For those who qualify, it would cost $6 per round trip for full fare or $5.25 with a monthly pass. Transit would match WSF’s half-price discount for youth, seniors and the disabled on full fares, but would also cut its monthly passes in half, which the state doesn’t. So while majority of riders would pay more for the quicker POF ride than the car ferry, some fast-ferry customers would actually save money. Here’s another fun fact. Kitsap Transit’s Bremerton-Port Orchard ferry service ranked 14th in the nation with 450,700 passenger trips in 2013, the latest year for which data is available. Agency officials want to make that point to show they’re not a bunch of rookies.They estimate the cross-Sound service would average about 800,000 a year more. Most people by now should know that the service would require a three-tenths of 1 percent increase in local sales taxes — an extra 3 cents on a $10 purchase. I’m not trying to persuade you one way or the other, but want to put it in perspective. The average adult would pay about $60 a year more in sales taxes. It isn’t collected on groceries, housing, heating, electricity, prescription drugs or health care. The sales tax could only be spent on ferry service. If voters were to approve the proposal, the existing foot ferries would be shifted to the new source of revenue. That would free up about $1.5 million for bus service, which would buy more than 23,000 hours of service each year, according to Kitsap Transit. It hasn’t been determined how it would be used. Washington State experimented with new ticketing procedures the past couple weeks at Fauntleroy to speed up loading, but they didn’t work. Today the process reverted back to the old ways of doing things. There are problems there that, under the circumstances, might never be fixed. The dock is too small, especially considering boats sail to two destinations from it. Neighbors don’t want it there in the first place and especially don’t want it to expand. Seattle won’t allow that to happen. It wasn’t too bad when they were running smaller boats there, mostly 87-car Evergreen State and Tillikum. Now the lineup features the 120-car Issaquah and Cathlamet. They can’t get them loaded and unloaded fast enough to stay on schedule. Ferries folks want to be on schedule. They’re held accountable for that. Riders would rather have late boats than to drop sailings to give the boats a chance to be on time. 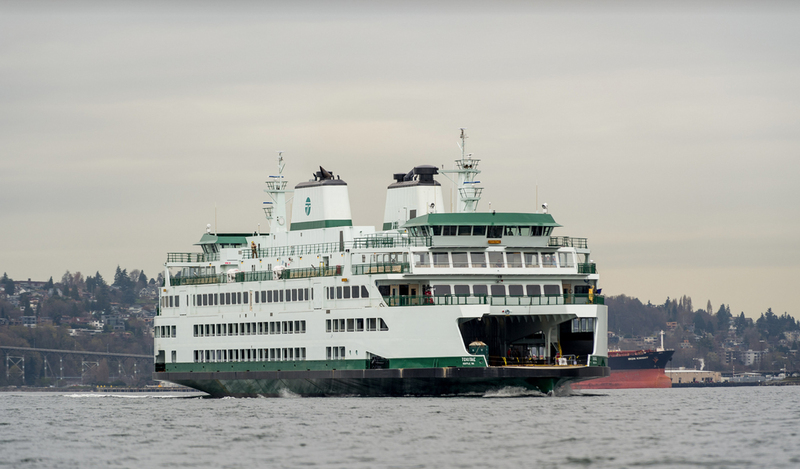 “Over the past three weeks, we have learned from passenger feedback and direct observation that the new procedures were not working,” Washington State Ferries said Thursday in a bulletin. Passengers with pre-purchased tickets will be waved through the tollbooth, and their tickets will be scanned on the dock. Passengers who don’t have tickets must stop to buy them at the tollbooth. WSF says it’ll continue to explore options to improve service within the constraints of the system. The Kitsap County Association of Realtors, a strong supporter of past passenger-only ferry efforts, won’t back the plan Kitsap Transit is putting on the November ballot. Association executive Mike Eliason said the organization’s government affairs committee listened to presentations Monday from Kitsap Transit executive director John Clauson and Poulsbo mayor Becky Erickson, a transit board member and POF foe. The 18-person committee was concerned about the boats themselves. Members worried about the foil-assisted Rich Passage 1’s endurance, and the potential for Rich Passage shoreline owners to knock it out with another lawsuit. They also believe adequate fare recovery would require larger boats than the proposed 150-passenger ferries for Kingston and 250-seaters for Southworth. “You can take two days of passengers on one run of the car ferries,” Eliason said. Bottom line, the plan fails the cost-benefit analysis, he said. The service would accommodate a maximum of 1,100 riders a day, who would be subsidized by the county’s other 260,000 residents, he said. “It ultimately comes down to almost half a billion dollar financial commitment, and it’s risky,” Eliason said. “We’re still very much supportive of the passenger-only ferry concept, but not this particular ballot measure. Several association realtors are high on the plan, including some who are part of a committee formed to support it, but they’re not on the government affairs committee, Eliason said. The Realtors were the first group to publicly support or oppose the ferry plan. 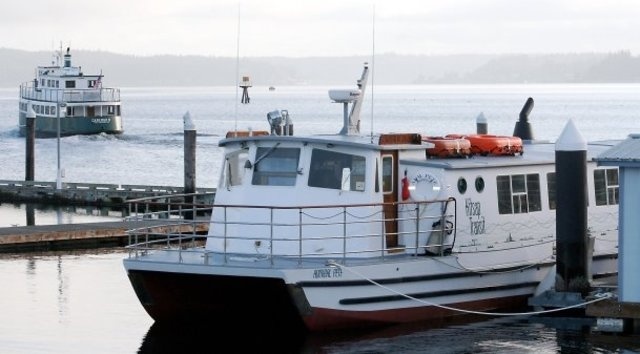 Kitsap Transit passenger ferry Admiral Pete will have a sister ship, but not a twin sister ship. Officials earlier decided the boat would be built of metal instead of wood, and hybrid-powered instead of by diesel. Another difference was discussed during the passenger-only ferry subcommittee meeting Tuesday. The new boat’s freeboard — the distance from the water line to the deck — will be 17 inches higher than the boats now in service, higher than the docks can handle. Bremerton’s Art Anderson Associates engineers were hired to suggest solutions. Either the boat will have to be modified for about $40,000 or the Port Orchard and Bremerton docks altered for $80,000 to $90,000. The ferry would need to have a chunk cut out, exposing a beam, which would have to be kept covered so water doesn’t splash in. The docks could be made adjustable to accommodate any boat. There are reasons for the different freeboards, Clauson said. They include design changes to improve safety and efficiency, revised Coast Guard regulations and better access to the engines. The agency hopes the ferry will be halfway built by the end of the year. * The POF subcommittee heard that Port of Bremerton commissioners are expected next Tuesday to approve the sale of the Annapolis Dock to Kitsap Transit. The deal will take about 60 days to close. A new ADA-accessible pier won’t be designed and ready to be built until about mid-2019. It would be completed by the end of 2020. * It appears the fast ferry Rich Passage I won’t be giving demonstration rides. Bremerton Mayor Patty Lent and Kitsap County Commissioner Charlotte Garrido broached the idea last month to offer rides during Armed Forces Day weekend so citizens could get a look at what they’ll be voting on in November. There are too many hurdles, however, including satisfying the state Public Disclosure Commission that it’s not a sales pitch and finding somebody besides Kitsap Transit to pay for it. Lent and Garrido said Tuesday if they can’t offer rides, maybe they could hold one or more of the agency’s quarterly community meetings on the fast ferry in June. It would remain docked. Discussions will continue. * The agency’s 2016-2036 long-range transit plan will be adopted at the board’s June 7 meeting. People can comment until May 16 to edwardc@kitsaptransit.com. Bremerton city councilman Richard Huddy offered comments about it Tuesday. He’d like to see more buses connecting cities and not just moving within cities. Worker-driver buses that sit all day at the shipyard are inefficient, he said. Use them on regular routes that emphasize PSNS. There are security obstacles to prevent that, but it doesn’t mean they can’t be overcome, Clauson said. Huddy added that park-and-ride lots, especially outside Bremerton, should be expanded so more shipyard workers and ferry riders can park there and take the bus.